Marines aboard a rigid-hull inflatable boat in the Gulf of Aden. Photo by Gunnery Sgt. Robert B. Brown Jr. The Navy’s official Image of the Day for Friday shows a team of Marines aboard a rigid-hull inflatable boat from the San Diego-based Makin Island Amphibious Ready Group. 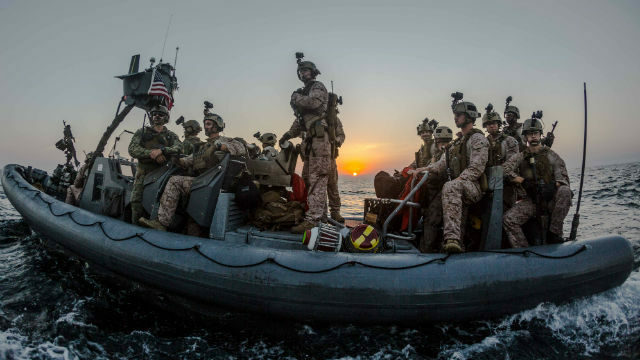 The Marines assigned to the Camp Pendleton-based 2nd Platoon, Maritime Raid Force, 11th Marine Expeditionary Unit were training to conduct a visit, board, search and seizure mission in the Gulf of Aden. The training was part of Exercise Alligator Dagger late last week. The USS Makin Island and its a accompanying ships and 4,500 Marines left San Diego in October. The stunning photo with the sun setting in the background was taken by Gunnery Sgt. Robert B. Brown Jr.